The jumping cholla also known as the “hanging chain cholla”. 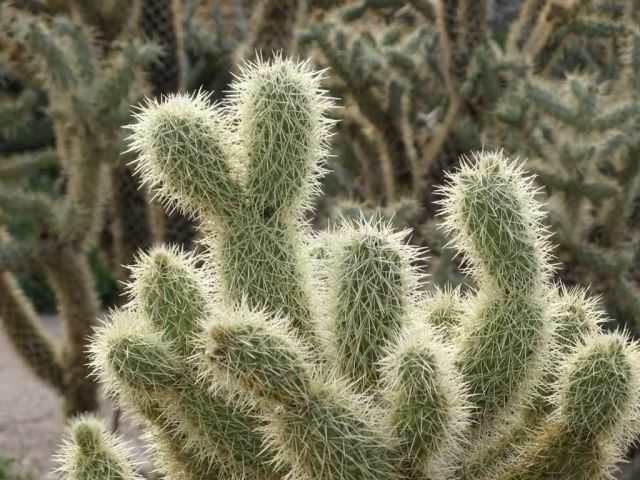 It is a cholla cactus native to the Southwestern United States and Sonora. It grows to heights of 4 m with drooping branches of chained fruit. Most of the fleshy, green fruits are sterile, pear-shaped to nearly round. They are typically about 4 cm long. It is these hanging chains of fruit which give it the name “hanging chain cholla”. The “jumping cholla” name comes from the ease with which the stems detach when brushed, giving the impression that the stem jumped. During dry period, animals like the bighorn sheep rely on the juicy fruit for food and water.